The Internet Small Computer System Interface (iSCSI) is an IP-based standard for connecting storage devices. iSCSI encapsulates SCSI commands in IP network packets, which allows data transfer over long distances and sharing of storage by client systems. As iSCSI uses the existing IP infrastructure, it does not require the purchase and installation of fiber-optic cabling and interface adapters that are needed to implement Fibre Channel (FC) storage area networks. 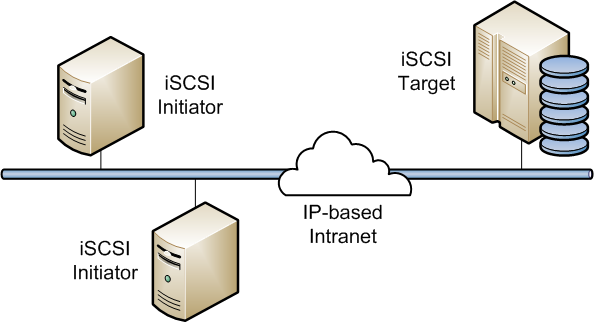 A client system (iSCSI initiator) accesses the storage server (iSCSI target) over an IP network. To an iSCSI initiator, the storage appears to be locally attached. Figure 18.1 shows a simple network where several iSCSI initiators are able to access the shared storage that is attached to an iSCSI target. A hardware-based iSCSI initiator uses a dedicated iSCSI HBA. Oracle Linux supports iSCSI initiator functionality in software. The kernel-resident device driver uses the existing network interface card (NIC) and network stack to emulate a hardware iSCSI initiator. As the iSCSI initiator functionality is not available at the level of the system BIOS, you cannot boot an Oracle Linux system from iSCSI storage. To improve performance, some network cards implement TCP/IP Offload Engines (TOE) that can create a TCP frame for the iSCSI packet in hardware. Oracle Linux does not support TOE, although suitable drivers may be available directly from the card vendor.